May 31st; my final picture of the Cartier to date, I've not been back I'm afraid to say, was at Able again, I had to be back in Sept Iles for my afternoon flight so I didn't drive too far into the Reserve. I was rewarded by a nice 'pure' set, led by 41, an ex-CN M636 from 1970. 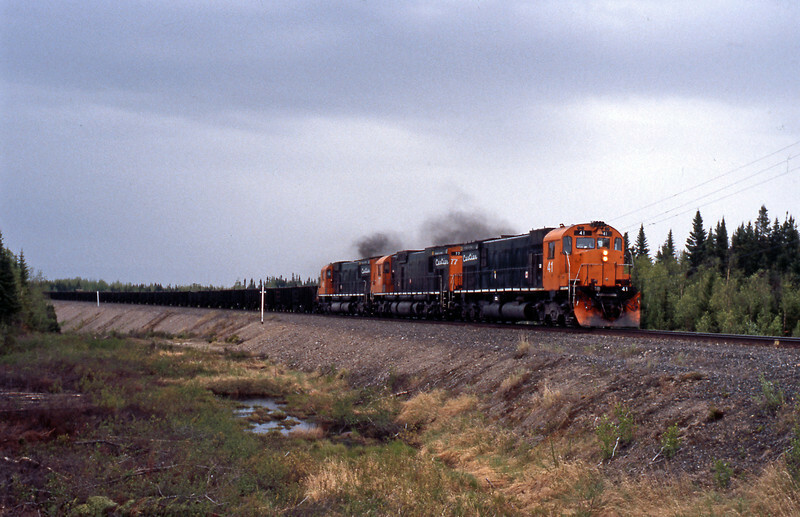 77, the second unit, is one of the three Alco C636 demonstrators which the Cartier acquired. They ride on the three axle Hi Adhesion trucks. Although they were rejected by US railroads they found a home in Quebec, in 2001 they were in their 34th year.